While Turkey is a country that produces its own cotton,and has a large textile industry for the export, it is really hard to find cotton fabrics. Only a few traditional fabrics, like these lovely and colorful flannels are made from cotton. This kind of fabric was first woven in the Haliç neighbourhood in Istanbul in the 1800's. It is called 'pazen' or 'divitin', from the french 'duvet', indicating that it is soft to the touch like a feather. 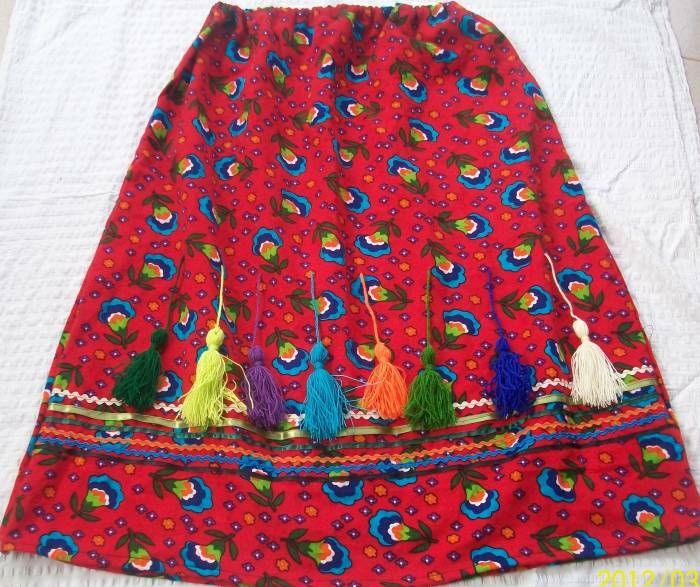 Used mostly for traditional long skirts and şalvars, pazen was never a high fashion product but more used in the country side. For a very long time, pazen was only used in rural areas with traditional dress, till 2002, when the beautiful Azra Akin became Miss World wearing a pazen dress designed by the couturier Cemil Ipekci. The dress was also choosen best dress in the world competition, and pazen became well known outside Turkey. Still when we go to fabric shops people often are suprised when we especially ask for pazen, instead of shiny satens and polyester. We have started a new collection of bags using this traditional fabric and oya, the gorgeous hand made lace used to edge the scarves of the rural women. This is not the first time that we are using traditional Turkish materials, we blogged about our oya collection several years ago. These are gorgeous fabrics, love the line of bags you make with them. Oh this is such gorgeous fabric!!! It is so beautiful when traditions don't get lost, especially such beautiful ones! I think that traditional handicrafts really do have a "soul", and they enrich a country beyond words! I absolutely love the amazing way you are turning these wonderful fabrics into new pieces, combining the two traditional products pazen and oya. And by the way, I am still enjoying my beautiful oya-scarf SO much!!!!! Interesting article and geooorgeous new bags. Hello, I wonder if you know where to get the pazen cloth (exact pattern) as the one wears by Azra Akin in 2002 Miss World. Hello, I wonder if you have the same pattern cloth as worn by Azra Akin in 2002 Miss World. Thanks! that exact pattern is not available anymore, I'm sorry.